But this very response demonstrates what is so broken about the CSR model as it is often practiced: charitable endeavors undertaken by a firm that have little to do with its core product or business practices, thereby reducing such endeavors to orphan initiatives that leave no lasting impact – like the feel good act of painting the community school and then walking back into a corporate culture that does not mirror these efforts (let alone depriving the for-profit local painter of employment). NGOs and watchdog groups argue that businesses aren’t doing enough, and whatever they do is too superficial. So business can seemingly never compensate for the great ills that it commits, finding itself caught in a vicious circle, responding to criticism in a way that only angers its critics further. Instead, in his bestselling book, Capitalism and Freedom, Friedman argued that “there is one and only one social responsibility of business–to use it resources and engage in activities designed to increase its profits so long as it stays within the rules of the game”. In other words, the business of business is business. And this is a good thing. While to some, ‘capitalism’ is invoked as a dirty word, to others it is seen instead as an unparalleled means by which to meet human needs, driving efficiency gains, pushing the boundaries of discovery and innovation, creating jobs, and building prosperity. Business acting as business, and not a charity, is among the most powerful forces mankind has to wield in addressing the complex pressures that we face on this planet. Take as an example this scenario: A sick child is in rural Kenya, with limited road coverage and no easy access to medical services. Using a mobile phone, her mother contacts a healthcare center who undertakes an initial diagnostic. This can be a simple but useful discussion about the symptoms, but may also extend to the use mobile based diagnostic tools. The initial diagnostic requires a small upfront fee, which is paid using mobile money. 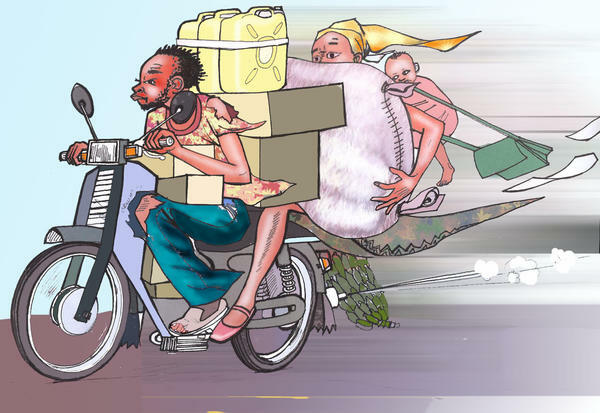 Now, the illness unfortunately requires the child to get to the clinic for actual treatment, so the mother calls a boda boda (motor bike taxi) driver to pick up her daughter. The boda boda guy rushes on a bike made in China or India – and soon Kenya – available now cheaper than ever before, weaving through village paths that are not accessible to normal cars. The child gets to the clinic and is thankfully attended to. All of this occurs through the provision of goods and services by private, profit maximizing firms and individuals, from the mobile operators who provide voice and money transfer services, to the bike manufacturer, to the boda boda entrepreneur. Perhaps even a private healthcare provider. It requires systems by which multiple industries and firms must be ‘connected’ together to enable this chain of interdependent transactions to happen. This is complex stuff, but once triggered and connected, the solution is in place and scalable to all Kenyans. The value lies in maximizing the connected effect through collaboration and alignment of interests, which then leads to cascading downstream benefits to other businesses and society at large. Lest this sound too rosy, there is one point to underscore in Friedman’s quote – this is only desirable as long as companies stay within the rules of the game such as abiding by rules that promote free and fair competition. So you can have a corporation that happily trumpets its good corporate citizenship while resisting the removal of barriers to competition which would likely lead to greater consumer welfare. Witness the raging war between the leading mobile company in Kenya, Safaricom – a company well known for its CSR initiatives – with Equity Bank that has introduced a thin-SIM card technology. One may also wonder whether Bill Gates’ grand global giving initiatives can really compensate for his supposed monopolistic practices when at the helm of Microsoft (but that’s another discussion for another time). Where companies’ CSR efforts fail to do anything substantially beneficial, it is largely because they follow the ‘orphan initiatives’ model, which feel good but leave no lasting footprint. What is more useful is to engage in open discussion on the reality of how business doing business naturally provides massive advantages to society – stemming primarily from jobs they create by providing quality products and services to their clients. And as businesses are incorporating environmental and social benefits into their core business models, from greening their operations and generating savings in the process, to taking a long-term view of what it means to interact with communities and nature when extracting resources, these advantages are magnified further.